General purpose floor levelling compound. Coat thickness: 5-35 mm. Coverage: 1.7 kg/m2 and mm thickness. Cemtop GP is indicated for use as a general purpose leveling layer for the preparation of floors before the application of tiles, carpets, vinyl, cementitious top layer, etc. As well as for diverse floors for areas of high traffic. It can be used on finishing surfaces for pedestrian traffic and low traffic commercial areas; Is also suitable for the application of a layer of Nitoflor FC130 and subsequently of Nitoflor FC140. Very fast application. Allows to apply large surfaces in one day. The one-component product eliminates the need for mixing on site and ensures the consistency of the blended product. Cemtop GP is a mortar designated as: EN 13813 Polymer-modified CT-C30-F6-AR2-B2.0. 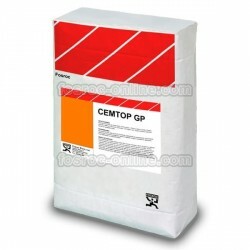 Cemtop GP is a blend of selected and modified cements modified with polymers and flowing agents. It is supplied in powder form which only requires the addition of water to produce a fluid self-leveling material. It is used in conjunction with the Nitoprime 33 primer. The values listed below are typical measurements. Values obtained on site may vary slightly. It is essential that both new and old concrete floors are properly prepared before applying Cemtop GP. New concrete floors must be at least 21 days old. They must be dry, clean and free from wax, grease, oils, soil, mortar residue and paint or residue from the healer, foreign or loose material and grout. Excess slurry should be removed by light blasting or thinning followed by washing and vacuuming to remove any traces of dust. Oil and grease stains can be removed with a chemical degreaser followed by a clean water rinse. In old concrete where there is deep seated contamination, mechanical methods such as sand blasting, grinding and roughing will be used to achieve a suitable clean surface. If you need advice or more information regarding the preparation of the substrate, contact Fosroc. The surface should be primed to prevent release of air from the substrate. Meticulously prepare the surface as described previously. Prime the soil with Nitoprime 33 (volume ratio, primer: clean water, 1: 5) and let it dry. Re-prime the soil with Nitoprime 33 (volume ratio, primer: clean water, 1: 3) and let it dry. Apply the required thickness of Cemtop GP on the primed and dry surface. Although the product has been designed to be applied by a pump, it can also be applied manually. This is a specialized activity that must be performed by an applicator authorized by Fosroc, knowledgeable about the product, and using an appropriate equipment. Typically, in areas of less than 100 m², it will be more practical to apply Cemtop GP manually. Mix 25 kg of Cemtop GP with the required volume of clean water (see table "Estimation"). A typical batch would be 2 bags of 25 kg of the product. Pour the water into a clean mixing bowl. Slowly add the powder to the water, mixing continuously with a low speed drill that has adjusted a mixing paddle. Mix at least 3 minutes until smooth and creamy. Make sure there are enough personnel to ensure an uninterrupted spillage mixing once the application has started. Apply Cemtop GP within 2 minutes after completion of mixing. Pour the mixed material onto the dry primed substrate, spread it with trowel and allow it to level. Pass a barbed roller across the surface to eliminate possible air entrained in the material and facilitate leveling. Do not over-work with the roller. To reduce joint formation, the newly mixed Cemtop GP should be applied within 5 minutes of previous product discharge. Note: If the mixture hardens, it should be discarded; Do not attempt to re-mix with water. The surface of concrete slabs on which Cemtop GP is to be applied must be at a minimum temperature of + 5 ° C and the ambient temperature must be equal to or greater than + 10 ° C during application. 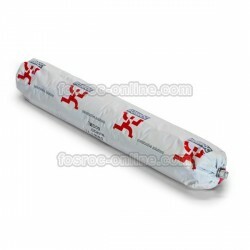 If the temperature is above 25 ° C during application, consult the Fosroc Technical Department. Protect from freezing for 48 hours. To prevent rapid drying, protect it from direct sunlight and dry air during application and initial curing. Possible movements or cracks in the substrate may be reflected on the surface of Cemtop GP. Cemtop GP should not be applied to asphalt substrates. Cemtop GP is not suitable for application outdoors or on surfaces that can get wet. Cemtop GP: 1.7 kg of powder per mm of thickness and m2 of surface. Store indoors, in a cool, dry place and in original and closed containers. The product has a storage period of 6 months from the date of manufacture, if stored in a dry place and in original and closed containers. If stored at high temperatures and / or in high humidity conditions, the storage period may be reduced to less than 3 months. 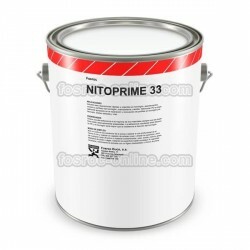 Nitoprime 33 has a shelf life of 12 months at 20 ° C. Protect it from frost and extreme heat. Cemtop products contain cements which, when mixed with water or moisten, give off alkalis which can be harmful to the skin. Avoid inhalation of dust. Avoid contact with skin and eyes. Wear gloves and goggles. In case of contact with skin, wash with water. In case of contact with eyes, remove immediately with plenty of water. 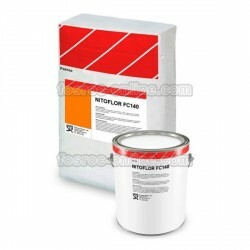 Nitoflor FC140 - Solvent based epoxy floor coating.